Outside of the five major religions, it is quite difficult to find accurate information about the other religious groups. More obscure religions like Taoism, Ancestor Worship, Tantric Buddhism, Scientology, Baha'i, Mormon, and even Atheism are not in the mainstream of our society in terms of the news, the culture, or on television. Yes, Atheism if a form of religion, too -- or at least a belief. And there are many other religions. Many are sects within a particular main belief system. For example, here's a list of the top 15 religions ranked by the size of their following. So anyone who wants to delve into the details and compare religions has a challenging job on their hands. And if they want to explore the many lesser known religions well, ....it may be a life's work. If you die tomorrow, are you going to go to Heaven? " Gee, I wish I knew ...." is the typical answer. and the way to Heaven is simply through faith in the Lord, God, and fulfill God's will. God's will is found most clearly in The Ten Commandments. and the way to Paradise si to adhere to the teachings of the Qur'an (in English, Koran), ardent devotion, and performing good deeds. and the way is through Reincarnation in a new body, and thereby, improving the Soul, to achieve an Oneness with Brahman (God). and the way to Heaven si to follow a fellow by the name of Jesus, his teachings and instructions, whom God sent down to planet Earth to help people understand. and the goal is achieve the state of Nirvana, which is a condition and not a place such as Heaven, or Paradise. all say it's a bunch of malarkey, a bunch of nonsense. Take the next step, and purchase the book. 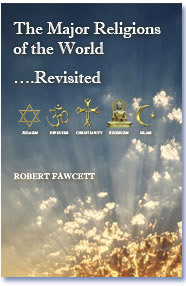 The book, The Major Religions Of The World... Revisited, is succinct, and gets to the core issues -- the key questions. You do not have to read the 'entire library' to understand the differences! It is comparative, and addresses the same key questions of each religion. A Creator? Origin of the Earth? Origin of humankind? Origin of evil & suffering? A messiah? Reconciling with God? What is each religion's role, their purpose?